Set includes a robust enameled 2.5 qt. 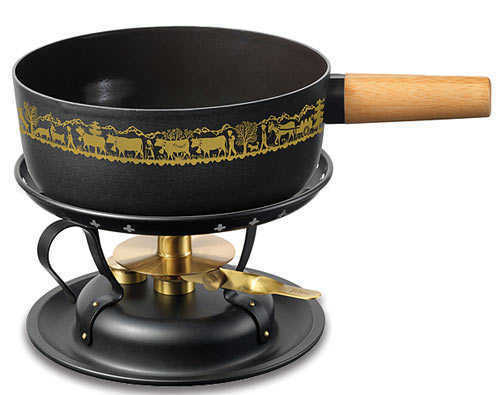 steel pan with wood handle, a classic "Ascent to the Mountains" design, a black lantern-style alcohol burner, and 6 light wood-handled cheese forks. Service Area: New Glarus, Beloit, Madison, Freeport, Rockford, Machesney Park, Fort Atkinson, Monroe, Oregon WI, Platteville, Waunakee and surrounding communities.